I'm officially joining The OKRA Picks Challenge! I know! I know! You might be asking yourself , "Why are you joining another challenge when you're already failing miserably at so many?" But I just swear I couldn't help it. First of all, it's being hosted by one of my very best friends Kathy/Bermuda Onion. Secondly, I do have a soft spot in my heart for Southern fiction. And lastly, have you seen the books? They are fantastic! The Okra Picks Challenge will run from October 1, 2010 through March 31, 2011. To join this challenge, all you have to do is pick your level of participation (you can always go up levels, but not down.) Then after you read any of the books, write a review to share your thoughts with others! You can join this challenge at any time. 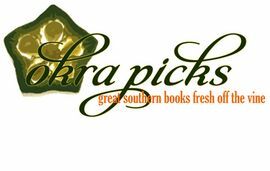 Just grab the Okra Picks logo at the top of this page and write a post announcing your intention to participate in the challenge — remember you don’t need to pick the specific books, just your level. Once you have posted your Okra Picks challenge post, come back to this post and click on Mr. Linky. Please leave your name and link directly to your introductory post (not just to your blog’s home page.) If you don’t have a blog, no worries — you can just leave a comment on this post telling me you want to participate. In the next few days I will add an Okra Picks Challenge tab to the top of my blog. When you click on the tab, you will see a list of all the participants as well as a place to link your reviews. I haven’t worked out all of the details yet, but I promise that there will be some prizes. I do know that your chances of winning will increase with each review you write. In other words, your name will be thrown in the hat each time you post a review. I'm going to start small and go with the "Goober" level (1-3 Books.) I feel so funny calling myself a goober, but I'd rather be safe than sorry. Maybe I'll manage to move up a level --that's allowed in this fun, no pressure challenge. Won't you consider joining us? I'm so glad you've decided to join and I didn't even have to twist your arm! I'm sure you'll love the books you read! I had the same thoughts as Rhapsody - you've been a DingDong, why not be a goober! I saw Kathy's post about the Okra Picks Challenge, and thought "I can't join (and fail) another challenge!" But, CROOKED LETTER CROOKED LETTER is on my TBR, and there are so many great books to choose from ... I'm weakening ... it may be time for some okra!